The Kelley brothers, Allen and Dean, brought national and international recognition to Peoria during their playing days with the Caterpillar team and their performances as members of the U.S. Olympic basketball teams. The Kelleys, honored by the U.S. Olympic Committee prior to the Los Angeles Games in 1984, are two of 15 area citizens who have taken part in the Games. Dean helped Kansas win the 1952 NCAA tournament and then played against Caterpillar in New York in a game said to be "the Olympic playoff tournament championship." Kelley scored 13 points against Caterpillar, then known as the Diesels but Cat won 62-60. Kansas, as NCAA champs, sent five players into the Helsinki Olympics including Kelley. Dean then started on four outstanding Caterpillar teams, starting in 1956. 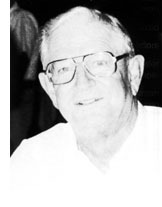 Allen, also played at Kansas, scored 20 points against Indiana in a losing effort in the 1953 NCAA championship game and then joined Caterpillar in 1955. He rejoined them in 1957 and played through. 1960, making the 1960 U.S. Olympic team for the Rome games. The Kelleys made Caterpillar the power of the AAU League.